The Los Padres National Forest, Monterey Ranger District, will be holding a public meeting to accept comments about the management of the Milpitas Special Interest Area. This area is commonly called the Indians. 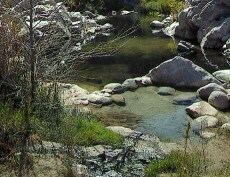 In 2005 the U. S. Forest Service recognized 9,948 acres on the Los Padres National Forest for its unique and important historic cultural and natural resources. Protection and preservation of the scenic nature of the area are two of the primary reasons the Milpitas Special Interest Area was designated. A management plan will define what resources are most important and why they are important to save. The plan will then define how best to manage important resources and how people will benefit from their management. In order to do this it is important to hear from persons who spend time in the area and know that the area is important. Comments may be made in person at the meeting which will be held at the Monterey Ranger District Office, 406 South Mildred Ave., in King City. The meeting will be on Tuesday, March 23, 2010 and begin at 6:00 pm. Comments may also be submitted to Bruce Emmens c/o Los Padres National Forest, 6755 Hollister Avenue, suite 150, Goleta, CA 93117 or faxed to 805-961-5729 (Attn: Bruce Emmens). The deadline for comments is April 7, 2010.